The struggle between Fewin Pty Ltd and Max Prentice is assuming mythical proportions. 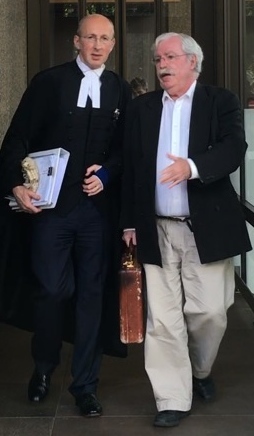 Robert Gilbert Coshott (R) outside court with his counsel yesterday. 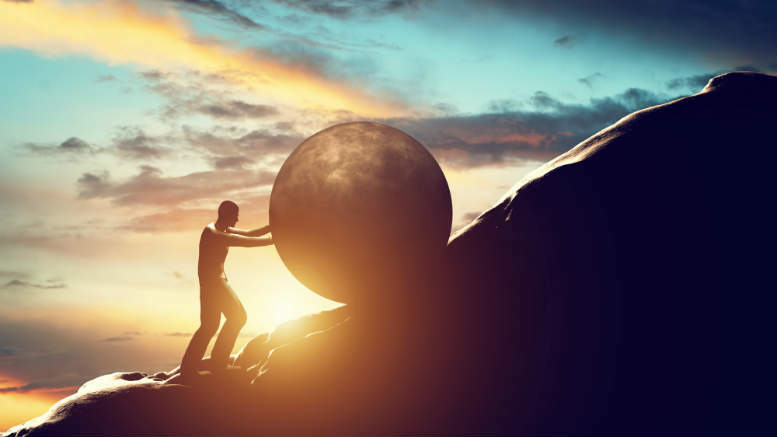 The seemingly interminable struggle in the Federal Court between Fewin Pty Limited and members of the Coshott family against BPS Recovery partner Max Prentice was again laid bare for chronicling yesterday. In the morning Justice Jacquie ‘how sweet it is’ Gleeson tossed out a leave for appeal application made by Fewin, Ronald Michael Coshott and Robert Gilbert Coshott. The applicants were objecting to orders made by Justice Robert Bromich on May 27 this year that allowed Prentice 60 days to file a bill of his costs incurred as trustee of discharged former bankrupt Robert Gilbert Coshott. Prentice had been appointed trustee on March 21, 2013. His claims for remuneration in the order of $372,196.50 plus GST effectively covered the period from the date of his appointment to October 14, 2015. Being creditors in the bankrupt estate Fewin and Ronald Coshott requested that a taxing officer tax Prentice’s claim, as they are entitled to do. When the taxing officer notified Prentice on February 16 this year that he had 28 days to provide a detailed bill of costs, Prentice failed to comply. Prentice however wrote to the Australian Financial Security Authority (AFSA) on February 17 outlining his reason why the taxation, if it was to proceed, should be deferred until after other proceedings the applicants had made, which at that time were scheduled for March 30, were heard. “It should also be noted that Ronald Coshott and Fewin Pty Ltd recently lodged an application in the Federal Court of Australia under sections 178 and 179 of the Bankruptcy Act which has been set down for hearing on 30 March 2016,” Prentice wrote. “The application seeks various declarations and orders which mainly centre of [sic] the validity of my actions and decisions at the meeting of creditors held on 16 December 2015 at which, Mr (Mark) Findlay attending by telephone. “Therefore, should the Inspector-General still consider it necessary to proceed with the taxation notwithstanding the concerns I have detailed above, I request that the taxation be deferred until such time as the above proceedings have been determined,” Prentice concluded. Subsequently, Prentice applied for an extension to the taxation notice and was successful before Justice Bromich. In their appeal application, the applicants complained that they were not given an opportunity to oppose the application to extend time “because Mr Prentice did not name them as respondents to the proceeding below,” the judge said. “If the applicants had been permitted to oppose the extension of time application, they would have argued that Mr Prentice had deliberately failed to comply with the relevant time limit with knowledge of the legislation and with the benefit of legal advice. In those circumstances, they say, the Court could not have been satisfied that the discretion to extend time should have been exercised in Mr Prentice’s favour,” Justice Gleeson said. Be the first to comment on "Fewin fails to pin Prentice on pay"